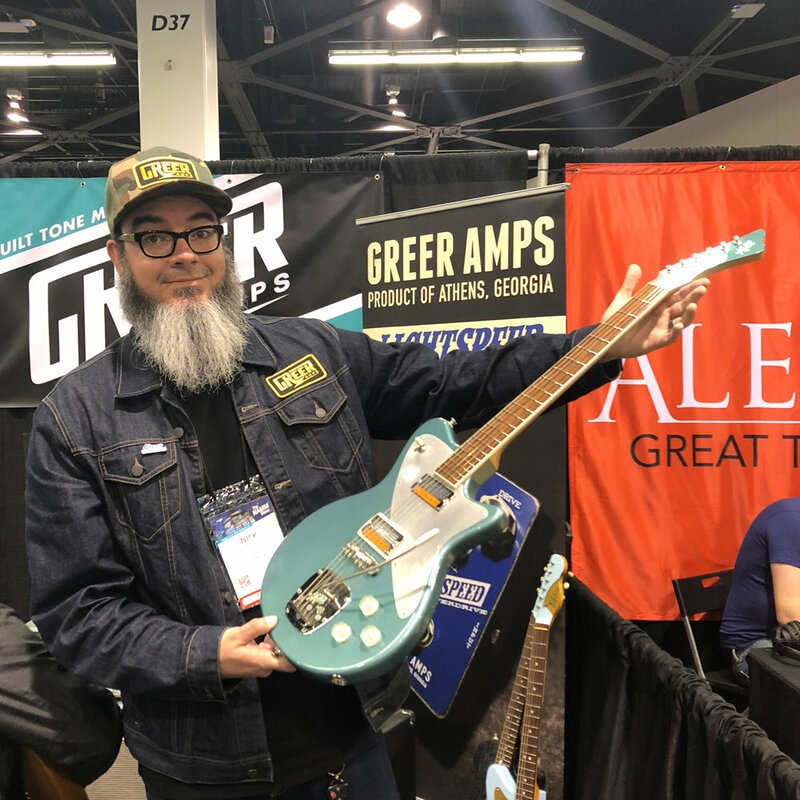 Wham Bam Thank You NAMM — Koll Guitar Co. It's that time of year again, friends. Time for the annual pilgrimage/circus called the Winter NAMM Show! We're taking a year off having a booth (and giving our VW truck a rest) but Saul and Gary are there making the rounds. And we’ve got new Koll instruments in several of our friends’ booths for your viewing and playing enjoyment. First up, a NAMM Super Cub! Modeled here by Nick Greer from Greer Amplification, it's equipped with Curtis Novak GT-V custom foil pickups and a Mastery bridge and tremolo. Light, fast, and fun. Play it today at Greer's NAMM booth 3647. This one will be available next week through our website, stay tuned for details. Here’s something new: a TV Yellow Super Junior Cub Glide! Wait, what the... Okay, this one is sort of a prototype mashup of a Junior Glide and a Super Cub, so we're not sure what to call it. But it's got a Junior Glide body shape and headstock, with a Super Cub's thinner depth and softer body edge. So it's basically a lighter, more contoured Junior Glide. And it rocks, with a solid mahogany neck and body, thin yellow nitro finish, a handmade TK Smith Summertone single coil paired with a Kent Armstrong lipstick, a Schroeder wrap, and some interesting knobs. Anna from EarthQuaker Devices (booth #4848) shows off the guitar below, stop by and check it out, and their awesome pedals. This one will be available from The Music Emporium. 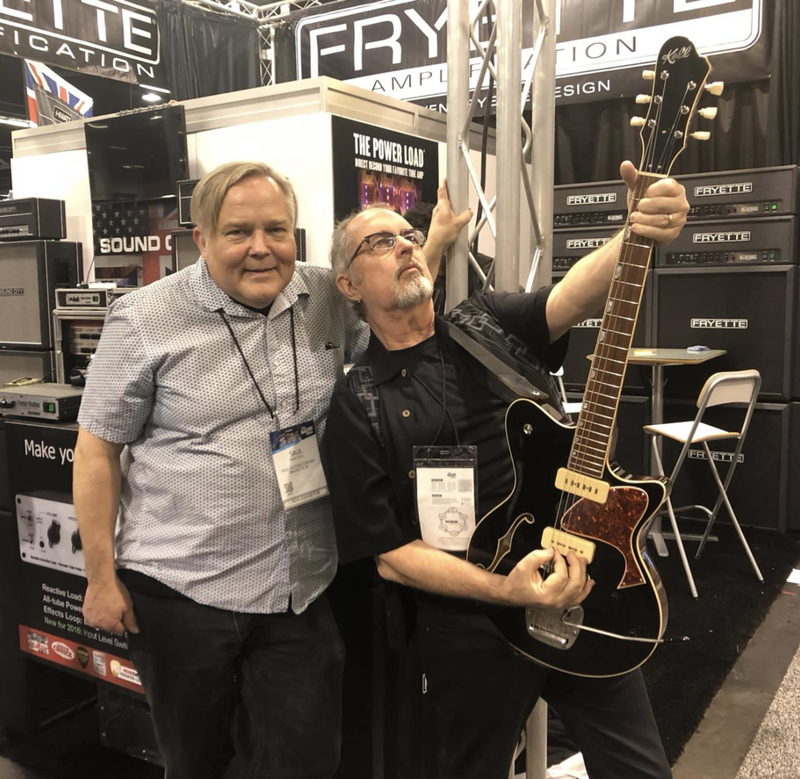 And finally this new black Duo Glide at the Fryette / Sound City amps booth (#5433). Modeled here by Steven Fryette, it’s got a semi-hollow mahogany body and maple top, deco guard and Mastery bridge/trem. It’s powered by a combo of Lollar and ThroBak P-90s. This one will be also available from The Music Emporium.